The response of a site to a seismic solicitation depends on local topographical and geomechanical characteristics. 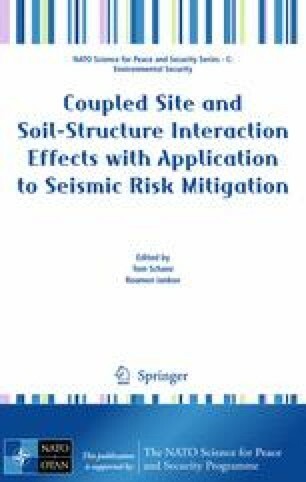 This paper deals with the evaluation of seismic site effects due to the local topographical and geomechanical characteristics and tries to contribute to establishment of a simple method to evaluate site effects. The amplification of surface motions is calculated by a numerical tool, HYBRID software, combining finite elements in the near field and boundary elements in the far field (FEM/BEM). In this paper, horizontal ground movements in various points of 2D empty valleys with irregular configurations subjected to synthetic SV waves of vertical incidence are calculated. Parametric studies are done on slopes, ridges and different shapes of canyons to characterize topographical site effects. The second part deals with sedimentary valleys. The complexity of the combination of geometrical and sedimentary effects is underlined. Extensive parametrical studies are achieved to discriminate the topographical and geotechnical effects on seismic ground movement amplifications in two-dimensional irregular configurations. The results are also shown in the form of pseudo-acceleration response spectra. For the empty valleys, we can classify the spectral response according to a unique geometric criterion: the “surface/angle” ratio, where surface is the area of the valley opening, and angle denotes the angle between the slope and horizontal line in the above coin. To assess the influence of the two dimensional effect on the spectral response of filled valleys, the response of alluvial basins are compared with the response of one-dimensional columns of soil. Finally, an offset criterion is proposed to choose a relevant computation method for the spectral acceleration at the surface of alluvial basins. The accuracy of this quantitative evaluation technique is tested and discussed.